It is located in the city center in a great location where you can walk to get to the main square, the National Theatre, the Cathedral, other architectural beauties, museums or any other attractions. One minute walk divides you from the tram station where trams run in all directions of the city. Direct tram line can take you to Maksimir Park with five beautiful lakes and quiet forest full of parks and of course a great zoo. Just 15 minutes from the hostel fancy is the Jarun lake where are many clubs and places for entertainment for the young. Zagreb is full of shopping malls, and one is only 15 minutes’ walk from the hostel – Immportane Center, where you can find everything you need. There is of course the Mc Donald’s, and many bakeries and pizza places. At the end a Passage takes you to the main railway station and a peaceful park for walking guiding you to the heart of the Zagreb – the main Ban Jelačić square. Very near is the botanical garden and museum Mimara, Croatian National Theater and other Zagreb’s must-see places. From main train station:Take a tram number 4 (direction “Savski most”), and get off on the 4th station (Zagrepcanka). Turn around and you will see a white business tower called “Zagrepcanka”, cross the street in that direction and walk 100 meters along “ulica Grada Vukovara” and on the right side is “Poljicka street” where our hostel is located on number 13a. Or you can just follow the yellow footsteps from tram station to our hostel! 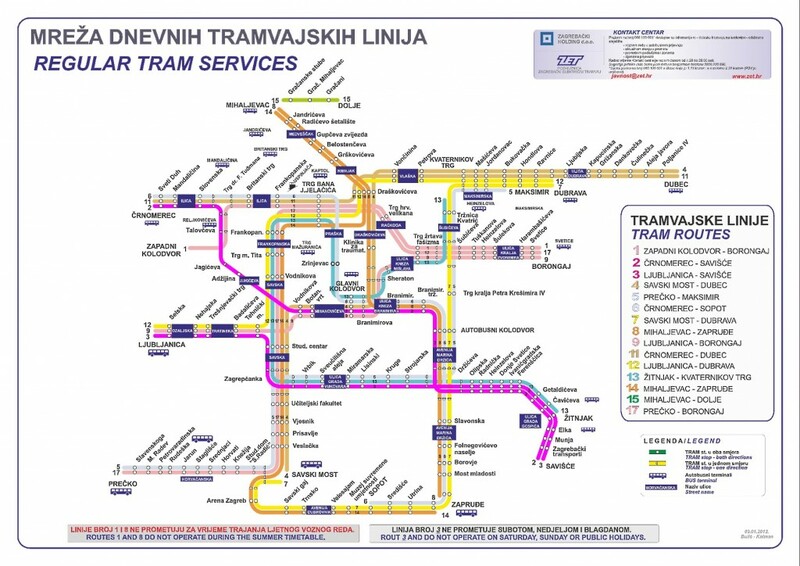 From main bus station:Take a tram number 5 (direction “Precko”), you get off on the 7th station (Zagrepcanka). Turn around and you will see a white business tower called “Zagrepcanka”, cross the street in that direction and walk 100 meters along “ulica Grada Vukovara” and on the right side is “Poljicka street” where our hostel is located on number 13a. Or you can just follow the yellow footsteps from tram station to our hostel! With car: It depends of direction from which you approach the city: west highway from Split and Karlovac, Ljubljana (Slovenija), east from Osijek, Varazdin, Budapest (Hungary) or Belgrade (Serbia), and south from Sisak, Sarajevo (Bosnia and Herzegovina). Hostel is situated just outside the city center. Streets that drive to hostel are “Savska” and right turn to “ulica Grada Vukovara” and after a 100 meters on the right is “Poljicka street” where our hostel is located on number 13a. From the airport: If you arrive by plane and land on the Zagreb Pleso Airport, you are about 20 km from the heart of Zagreb. You can take a taxi (about €12) to our hostel. If you like you can take the inexpensive Croatia Airlines bus which takes you to the main bus station in Zagreb. Buses leave every half an hour outside the airport terminal, and tickets, at the price of HRK 30 (£3/$5.50/€4.50), can be bought from the bus driver. Once you arrive at the bus station (look directions above), you can flag down a taxi or use a tram to complete your journey.